Wales – Go visit! But not the way we did. After a month at a home exchange in Edinburgh, Scotland we had 4 days before meeting with friends in England and we had never been to Wales. A bit of research showed the coastline to be rugged, gorgeous and perfect for a road trip. National Parks, castles, wild horses, beaches, thriving coastal towns, clifftop hiking paths, and mountains make Wales a romantic adventure. Foolishly, we tried to see it all. Yes, we did it wrong by trying to see so much, but we saw enough to know that we’d love to return. Next time we’ll take our time visiting Wales properly. Each of these areas has SO much more to explore, so here is just a taste of what you can expect. As the gateway to Snowdonia National Park, beautiful Betws-y-Coed is one of very few villages that exist within the 800 square miles of wild rocky mountains, hidden valleys, cascading rivers, waterfalls, still glacial lakes and deep forests. Snowdon is the highest peak in England and Wales at 3,560 feet. This is lovely Swallow Falls. The Snowdonia area in north central Wales is certainly pretty, but we’re a bit spoiled for mountain beauty as we had recently been to the Scottish Highlands and the Isle of Skye, plus we live in Colorado. As we drove along the River Dee we happened upon the annual Faery Festival in Llangollen! Not so fun for traffic, but such a blast! Music, shops, food, costumes…it was bustling. Historically, Llangollen’s location made it prominent in commerce, but its mythical history is fascinating. There are the ruins of a castle, of course, Crow Castle, which was the possible burial site of the Holy Grail of the Arthurian legends. If we had driven thru this area on a normal day we would never have learned so much. Who would know that amateur theater productions thrive here with over one hundred groups producing high-class plays, musicals, operas, cabaret and concerts. Must…go…back! As you approach Conway, the imposing Conwy Castle defines the town and the medieval feel is emphasized by the well-preserved wall surrounding the town. Walk the Conwy Suspension Bridge, marina and quay, nature preserve and much more. Wait, is that a toilet seat on the beach? Considered the most technically perfect castle in all of Britain with ingenious architectural designs and at least 14 obstacles for invaders, Beaumaris Castle was begun in 1295 and NEVER completed. Its location, partial moat and the beauty of Beaumaris town make it an excellent excursion. Cross the Menai Suspension Bridge and enjoy the coastal drive. Majestic Caernarfon Castle gained worldwide fame as the setting for the Investiture of English Prince Charles as Prince of Wales. Fitting, given its history. Today, there’s much to explore along the harbor and plenty of restaurant choices nearby – we found some delicious Greek food at Ouzo and Olive. Looking out over Tremadog Bay, Criccieth is another nice coastal town with the dominating Criccieth Castle, sandy beaches (with heart shaped rocks), water sports, plus nice dining and shopping options. We enjoyed our stay at the George Hotel. A contrived Italian village that wanted 15 pounds per person (plus parking) for the privilege of walking through their shops and restaurants to spend more money. We decided to pass, but enjoyed the tunnel of hydrangea bushes on the approach drive. We approached Aberystwyth from the northeast with the sole purpose of taking the coastal road south to Cardigan. What a fantastic surprise as the town came into view! Immediately we knew we’d regret not having more time here. It’s a vibrant university town with lots of art, shopping, cafes, bars, and restaurants that happens to be “oh, so happily” set between several hills with castle ruins, beaches, a pier, harbor and seafront area with well loved, charming Victorian / Edwardian buildings. Ever wanted to sleep in a castle? We did! Thanks to luck (and the internet) we found that Cardigan Castle had just renovated two rooms as bed and breakfast rooms. We were their second guests ever and since we arrived after dark when the castle tour office was closed for the day, there was a bit of confusion about checking in. Finally, we noticed a gate with an unlatched padlock – beyond it was a short driveway with a couple of side doors – one of those doors had an envelope sticking out with our names on it and a number to call. The friendly caretaker arrived two minutes later with our keys and instructions. After this nervous beginning we thoroughly enjoyed our two night stay. Our room (called Yr Afon on our lovespoon room key, which we think means “by the river”) was spacious, clean, and modern with a comfy bed. So, you get all the benefits of exploring the medieval grounds and castle, without the dust and cold. 🙂 Breakfast was plentiful and delicious, plus every staff member we met was super genuine and friendly. Probably our favorite town in Wales and definitely on the wishlist to return. Settled as early as the 9th century, the area thrived greatly based on its naturally protected harbor. By the 18th century royal politics and plague resulted in almost complete ruin and abandon. From 1802, ONE man’s efforts (and funds) created an in-demand health resort community for wealthy Victorian vacationers. ..with baths, springs, and beach walkways for nannies with prams. Being one of the sunniest locations in Wales, Tenby focuses on being a healthy escape with the Pembrokeshire Coast Path for walking, 2.5 miles of sandy beaches, truly charming market streets, cafes, sailing and more. Take a deep breath and drink it in! We ran out of time to explore the town, so we learned a bit about Pembroke Castle and snapped a few pics. Possibly the largest castle still privately owned in Wales, Pembroke Castle has made several film appearances. Probably the crown jewel of Wales from a spectacular scenery standpoint – we only saw one corner of it and we would love to explore more. Perhaps that’s why National Geographic voted it the 2nd best coastal destination in the world in 2011. Many dozens of beaches, rugged cliffs, estuaries, marine reserves, conservation areas, marshes and even forests…and we felt we had it all to ourselves! Along the coast is the Pembrokeshire Coast Path. This 186 miles of path is mostly at cliff-top level, with a total of 35,000 feet (11,000 m) of ascent and descent. You can easily imagine how it feels to enjoy the sounds and scents of the sea atop an isolated cliff. 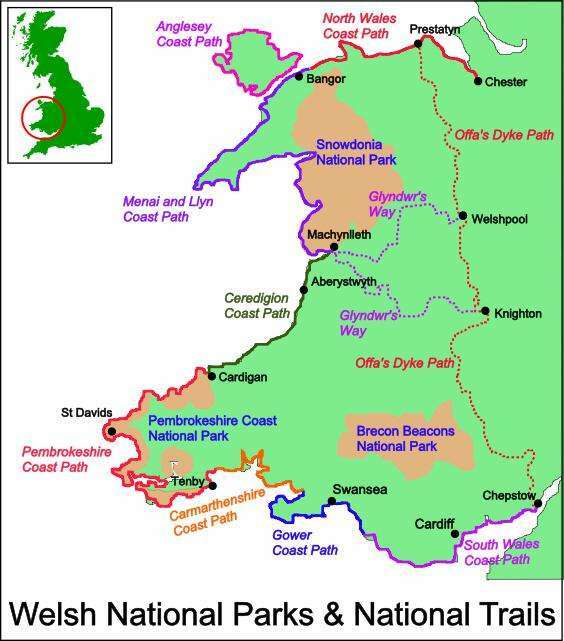 Pembrokeshire Coast Path is only one section of the Wales Coast Path which extends for 870 miles! A clean, modern, bustling city, but with the historic buildings, including a castle, of course. It’s tough enough to drive a rental (hire) car on unfamiliar, twisty roads, with no shoulder (or a rock wall or hedge as a shoulder), driving on the left, and shifting gears with the left hand – but the Welsh like to tailgate. I never feel the need to pull over to let others pass when driving at home, but had to do it all the time here. It’s a minor complaint overall, but it was ubiquitous. Wales is a beautiful country! So, now you see how gorgeous these areas are and why it was maddening to rush through them! We didn’t even realize we’d visited 17 towns/areas until we were writing this story. Please don’t experience it the way we did. Next time, we’ll pick just one or two destinations and do more local exploring – and throw in some long romantic dinners and a few coastal hikes and picnics. Did you know? The term “spooning” originated in Wales. Welsh lads have given hand-carved wooden lovespoons to the young girl of their affections for at least 350 years. They indicated their intent as well as showcased their skills with intricacy and symbols. From this romantic custom we get the word “spooning”! Today, lovespoons are given for many occasions or simply as a gift of affection.
? Have you been to Wales? Where? Did you know about their amazing 870 miles of coastal walking path? Scottish GIFTS for YOU – Travel blog Contest! Summer in Scotland, Wales and England – Returning to the scene of the crime.